This is yet another garland I made for the #CraftBlogClub gift swap taking place this month. As you know, I made the first crochet rose garland quite early on before I even knew who would receive it. I just felt like making a rose garland for the first time and I really love it. 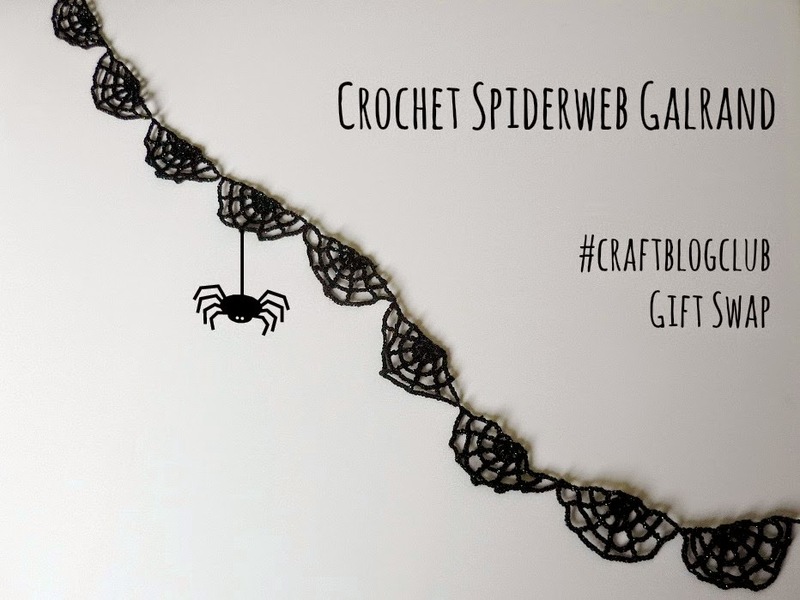 Luckily, my swap partner happens to be the one person I know best from our little Twitter group and I immediately had an idea for another garland that would suit her even better: spiderwebs! She is getting her PhD in film studies and loves horror films. Perfect! I used the half spiderweb pattern from Crochet it Baby, but only crocheted the first four rows to keep the webs small. Once I had nine of these, I just tied the webs together and it's a good length for a small garland to hang on your mantelpiece, for instance. I think I might actually make one for Halloween. The yarn has been part of my stash for years, but I never knew what to do with it. It is 100% acrylic with multicoloured lurex in it: Woolcraft Diamonds DK lurex blend yarn 2001 in black/gold. I still can't think of anything else to do with it! If you have any ideas, please let me know. It's totally going up in my room! Glad you like it! I just had to make it for you. Black glittery spiderwebs are surprisingly fun. Hm, interesting! It could certainly work. Hi Josie! It was a good thing I had the yarn in my stash. It is perfect for this garland. What On Earth Is a Diz?